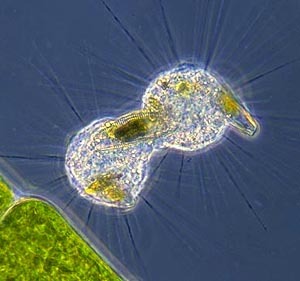 Amoeba proteus, pseudopods slowly engulf the small desmid Staurastrum, (see illustration on Desmid page). Amoebas (Phylum Rhizopoda) are unicellular protists that are able to change their shape constantly. Each species has its own distinct repertoir of shapes. How does an amoeba locomote? Amoebas locomote by ways of cytoplasmic movement. (cytoplasm is the cell content around the nucleus of the cell) The amoeba forms pseudopods (false feet) with which they 'flow' over a surface. The cytoplasma not only flows it also changes from a fluid into a solid state. These pseudopods are also used to capture prey, They simply engulf the food. They can detect the kind of prey and use different 'engulfing tactics'. The image shows several cell organelles. 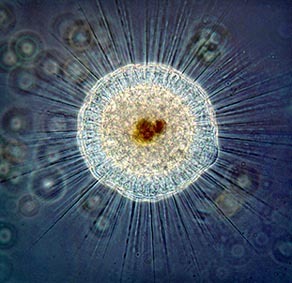 Left from the center we can see a spherical water expelling vesicle and just right of it, the single nucleus of this species can be seen. Other species may have many nuclei. The cell is full of brown food vacuoles and also contains small crystals. 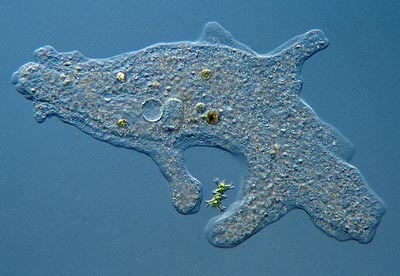 Amoebas can grow to exceptionally large sizes for a unicellular organism. Some species are 5 millimetre long. They can reach such a size by having many nuclei within their single cell. Amoebas are not known to have any sexual way of reproduction. They only multiply by cell division. Sometimes Heliozoa can be found feeding on the same prey. In this image 2 individuals of the species Actinophrys sol are feasting on a diatom. Some amoebas form a shell from found material that they glue together to form a protective covering. Often sand grains or other particles are used to make the construction, called a 'test' stronger. 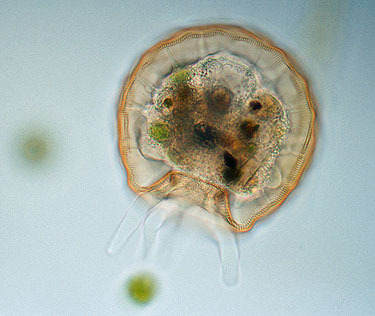 You can see how this shelled amoeba hangs in its test keeping contact using thin pseudopods. Long pseudopods are extruded to capture prey. Relatives of the sun animalcules that live in marine waters make beautiful glass skeletons from which the axopods protrude. They are known as 'Radiolaria'. Other somewhat related organisms are the foraminifera, often called forams. They also make a shell. Some fossil species did reach formidable sizes up to 10 cm. wide. Foraminifera - a gallery of these beautiful marine microorganisms. Finding the recent chalk makers - going on a sea-side holiday? Here's a guide to where to hunt for beautiful microscopic subjects on a beach, and the sort of coastline to look for. Foraminifera sand - an introduction to 'forams', with a look at a world famous sand from 'Dog's Bay', Ireland.